On December 17-18, 2015, EIEF hosted the “5th EIEF-UNIBO-IGIER Bocconi Workshop on Industrial Organization”. The event was a joint initiative of the Bologna Center for Law and Economics (BCLE - University of Bologna), the Einaudi Institute for Economics and Finance (EIEF) and IGIER-Bocconi. 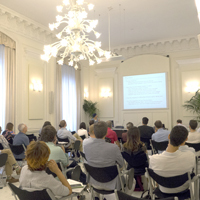 The workshop aims to strengthen the relationship between Italian economists working in the field of Industrial Organization, both in Italy and abroad, by bringing them together to discuss new research. In order to stimulate interaction, the program consisted of a small number of papers, which were presented in a plenary session and ample time was left for discussion and informal interaction. Contributions in theoretical and empirical IO were equally represented. For details, see the Program. On 25-26 November 2015 EIEF hosted the 2015 Strategic Forum on “Measuring economic, social and environmental resilience”. The event was a joint initiative of the International Economic Association (IEA), the International Statistical Institute (ISI), the OECD and the OECD-hosted High-Level Expert Group on the Measurement of Economic Performance and Social Progress, supported by the Bank of Italy and the Italian National Institute of Statistics (Istat), and sponsored by SAS. For more information, please consult the Program. On November 13, 2015, EIEF hosted the presentation of the Global Monitoring Report of the World Bank and the International Monetary Fund for 2015-2016, “Development Goals in an Era of Demographic Change”, co-organized with the World Bank Group. The report assesses the progress towards ending extreme poverty by 2030 and in promoting shared prosperity, unveils the new international poverty line, provides updated estimates for the number of people living in extreme poverty, and analyzes how profound demographic shifts could alter the course of global development. The outcome of the report was presented by Kaushik Basu, Senior Vice President and Chief Economist of the World Bank, followed by a Panel Discussion with the participation of Massimo Livi Bacci (Professor of Demography at the University of Florence) and Andrea Cornia (Professor of Development Economics at the University of Florence), coordinated by Patrizio Pagano (Italian Executive Director at the World Bank). For further details, see the Program. The Einaudi Institute for Economics and Finance (EIEF), the Research Center SAFE (Sustainable Architecture for Finance in Europe) at Goethe University Frankfurt, the Copenhagen Business School, HEC Paris, and the Swedish House of Finance (SHoF) organized the 2015 European Conference of the CEPR Network on Household Finance, hosted by Goethe University at Frankfurt. The conference was the sixth in a series of annual European conferences and aimed to present state-of-the-art empirical research and empirically motivated theoretical research on household financial behavior and on how this is influenced by other choices, government policies, and the overall economic environment. Previous sessions were held in Athens, Rome, Oxford, Stockholm (go to Axa Chair for further details). For more information, please visit the SAFE’s website. 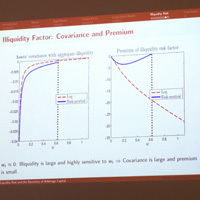 The Centre for Studies in Economics and Finance (CSEF), the Einaudi Institute for Economics and Finance (EIEF) and the Stanford Institute for Theoretical Economics (SITE) organized a conference that brought together researchers from financial economics and labor economics in order to discuss the topic from the point of view of both disciplines. 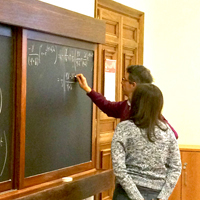 This conference was funded by two ERC Advanced Grants, respectively awarded to Claudio Michelacci for research on Estimation of General Equilibrium Labor Market Search Models (no. 293692-ESEMO) and to Marco Pagano for research on Finance and Labor (no. 295709-FINLAB). Related conferences were organized by CSEF in 2013 (1st CSEF Conference on Finance and Labor) and SITE in 2014 (Session 9: Interrelations between Financial and Labor Markets). For further details, see the Program. Summary. 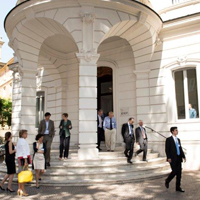 EIEF hosted the “4th Rome Junior Conference on Macroeconomics”, a.k.a. Pizzanomics. The aim was to bring together junior economists from around the world with a strong interest in Macroeconomics, and to generate a friendly environment with intensive interaction, not only during the presentations but also informally before and after. The conference consisted in 10 presentations of 60 minutes each. Speakers received direct invitation. The organizers were: Guillermo Ordoñez (University of Pennsylvania), Facundo Piguillem (EIEF), and Nicholas Trachter (FED, Richmond). For more details, see the Program. On Friday May 8, 2015, EIEF hosted the 2015 4nations cup. The contest brought the most promising young scholars in financial economics together in one day of ‘mini seminars’ lasting 40 minutes each. In the 2015 edition, the Contestants came from universities in Denmark, Great Britain, Italy and Sweden. The contestants who were selected for the tournament were: Steffen Andersen (Copenhagen Business School), Bo Becker (Stockholm School of Economics), Paolo Colla (Bocconi), Erik Hjalmarsson (University of Gothenborg), Ralph Koijen (London Business School), Ian Martin (London School of Economics), Morten Sørensen (Copenhagen Business School), Hannes Wagner (Bocconi). Steffen Anderson and Morten Sørensen from the Copenhagen Business School were the winners of the competition. For the images and the program of the event, please visit the 4nations cup website. On January 27, 2015 EIEF hosted the “Presentation of the World Development Report of the World Bank for 2015, Mind, Society and Behavior”, co-organized with the World Bank Group and the Italian Treasure Ministry. This year the report highlights the importance of experimental economics as a method for understanding problems related to the development and design of the policies which support it. The outcome of the report was presented by Anna Fruttero, a Senior Economist for the World Bank. A Round Table followed with the participation of Stefania Bazzoni (Treasure Ministry), Giampaolo Cantini (Foreign Affairs Ministry), Luigi Guiso (AXA Chair Professor, EIEF) and Lia Quartapelle (Secretariat for the Foreign and EU Affairs Parlamentary Commission). The event was by invitation only. For more details please see the report.